This beauty is alllll because of Ben. 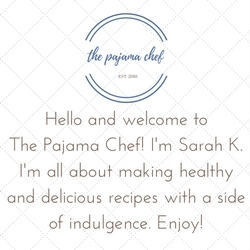 [Who just started a blog, p.s.] 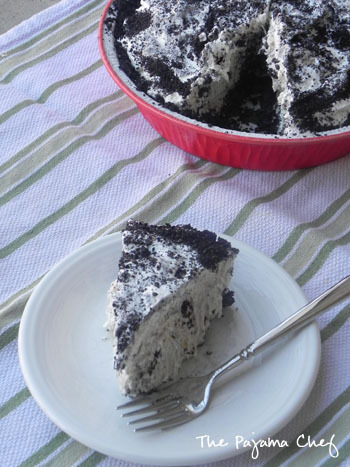 Apparently, in his high school cafeteria, Oreo Ice Cream Pie was all the rage. Along with weenie winks [hot dogs wrapped in American cheese and white bread, then baked]. Look at this photo at your own risk, I’m not quite sure how anyone would find that appealing. But apparently some do. I can guarantee that pretty much everyone will find this pie appealing. And delicious. Certainly, delicious. I don’t think I ever ate anything this good in my high school cafeteria, partially because we had open campus so I often went home or out to eat. But I digress. Who cares about high school food? That was so last decade! Instead of lamenting about the old caf, you can make an easy no-bake dessert at home that you can enjoy for days [if it lasts that long!!]. Crush 24 Oreos in a ziploc bag or food processor until you have fine crumbs. Transfer to a large bowl, then pour melted butter over cookie crumbs, stirring well to combine. Press mixture onto the bottom and sides of a 9 inch deep dish pie pan to form the crust. Spoon ice cream over crust, then cover completely with Cool Whip. Crush 2-3 remaining Oreos and sprinkle over Cool Whip. Cover tightly with aluminum foil and return to freezer for at least 2 hours before serving. Alternatively, you can stick the pie in the freezer uncovered for about 20 minutes, then remove it and stick a few toothpicks in the Cool Whip and then cover it with foil, using the toothpicks to hold up the foil so it doesn’t stick. Then return to freezer for at least 2 hours before serving. Linked up with: Weekend Potluck, Foodie Friday. maybe i’ll make you some when you come down to TN! 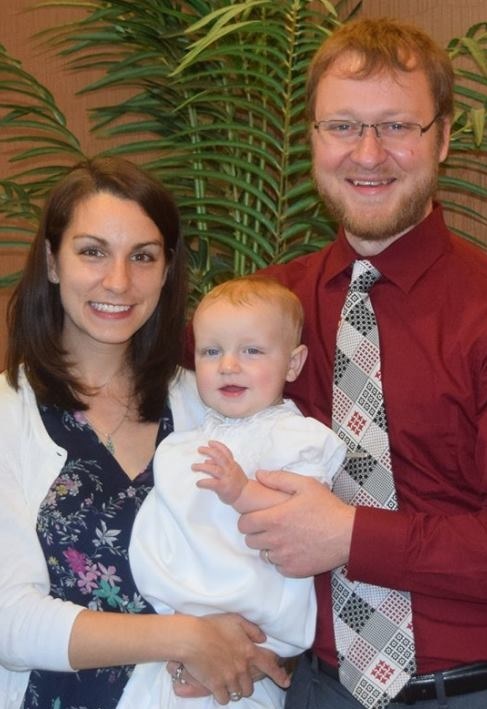 Also, Ben’s blog is hilarious. I was cracking up at his “about” page. Wow. Our cafeteria food was never this good!! That weiner winks picture is hilarious – those look so gross! But this pie, now that looks amazing!! Definitely did not have anything like that in my cafeteria! Oh my GOSH. So simple and it looks SO delicious. I am craving this right now! Now that is what I call quick & easy! I would easily eat that whole thing! haha it’s so rich that i definitely couldn’t do that. 🙂 it is good though! When I moved out to NJ, we had an overnight pit stop in PA. I grabbed an Oreo pie from Sheetz and it was the best thing ever. 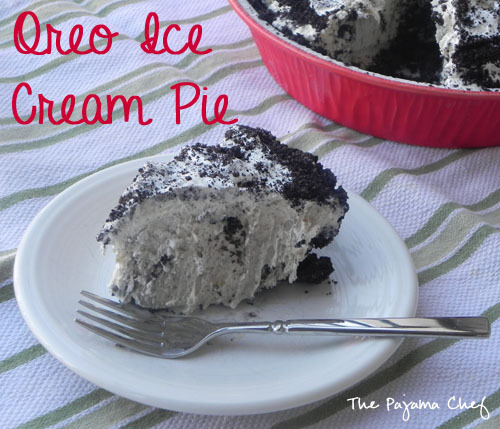 It reminded me of the oreo ice cream cakes my mom used to make for my birthday. 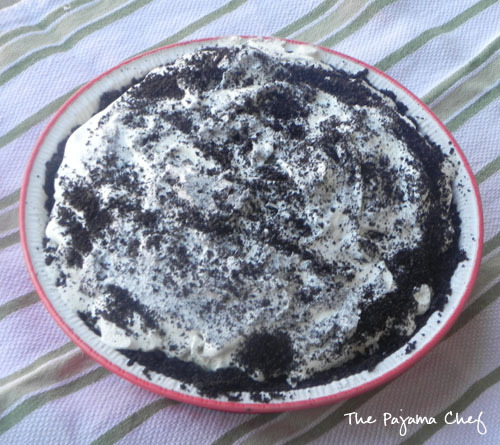 So, I like Oreo pie and I love that you posted this recipe!